Douglas Corrigan with his modified Curtiss Model 50 Robin B, NX9243, at Floyd Bennett Field, July 1938. 17 July 1938: For more than ten years it had been Clyde Groce Corrigan’s ambition to emulate his hero, Charles A. Lindbergh, and to fly solo, non-stop across the Atlantic Ocean. An aircraft mechanic, he had worked on the construction of the Spirit of St. Louis as an employee of Ryan Aircraft Co. in San Diego, California. Corrigan had assumed the first name “Douglas,” possibly out of admiration for “The King of Hollywood,” actor Douglas Fairbanks. 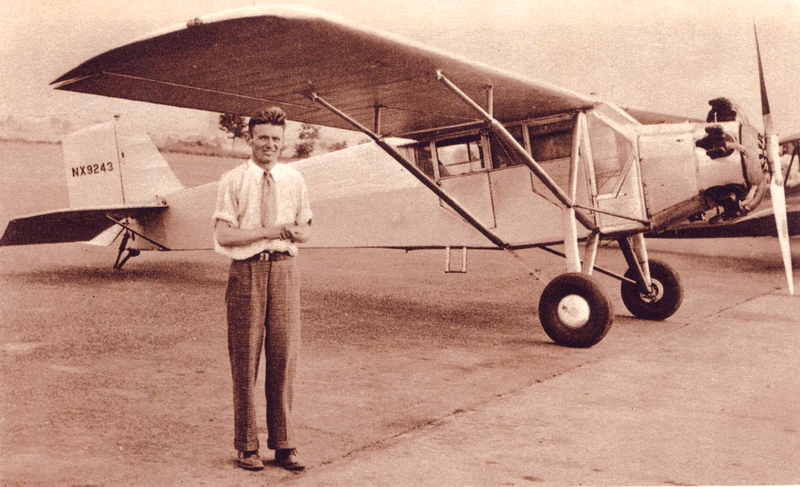 In 1933, Corrigan and his younger brother Harry Groce Corrigan, an aeronautical engineer, bought a 1929 Curtiss Model 50 Robin B, a single-engine, high-wing monoplane. The Robin was 25 feet, 8½ inches (7.836 meters) long with a wingspan of 41 feet (12.497 meters) and height of 7 feet, 9½ inches (2.375 meters). In standard configuration, the Robin weighed 1,472 pounds (667.7 kilograms) empty, and 2,440 pounds (1,106.8 kilograms) loaded. Its cruise speed was 84 miles per hour (135 kilometers per hour) and the maximum speed was 100 miles per hour (161 kilometers per hour). The range was 480 miles (773 kilometers). Corrigan continuously worked on the airplane, repairing, overhauling, re-skinning, modifying. He replaced the Robin’s original water-cooled 502.65-cubic-inch-displacement (8.237 liter) Curtiss OX-5 V-8 engine (rated at 90 horsepower at 1,400 r.p.m.) with a more modern, more powerful, Wright “J-6-5.” This engine was an air-cooled, supercharged, 539.96-cubic-inch-displacement (8.848 liter) Wright R-540 Whirlwind 150 single-row 5-cylinder radial which produced 150 horsepower at 1,800 r.p.m. The direct-drive engine turned a two-bladed propeller. In this configuration, the airplane was a Robin J-1 (Curtiss Model 50H)He also installed extra fuel tanks. The Whirlwind 150 was 3 feet, 51.1 inches (1.044 meters) long, 3 feet, 9.0 inches (1.143 meters) in diameter, and weighed 370 pounds (168 kilograms). 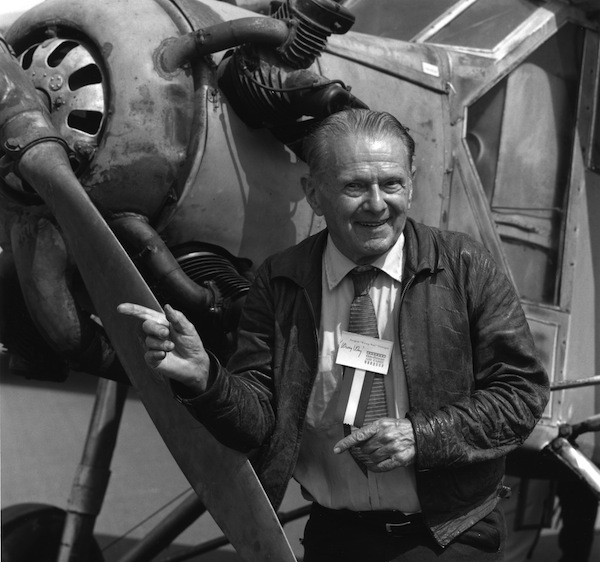 The Bureau of Commerce had repeatedly refused to authorize Corrigan’s requests to make a trans-Atlantic flight as his airplane was considered unsuitable for such a flight. He decided to go anyway. In early July 1938, Douglas Corrigan made a non-stop flight from Long Beach, California to Floyd Bennett Field, Brooklyn, New York. He announced that he would make the return flight and had his Robin fueled with a total of 320 gallons (1,211.3 liters) of gasoline. 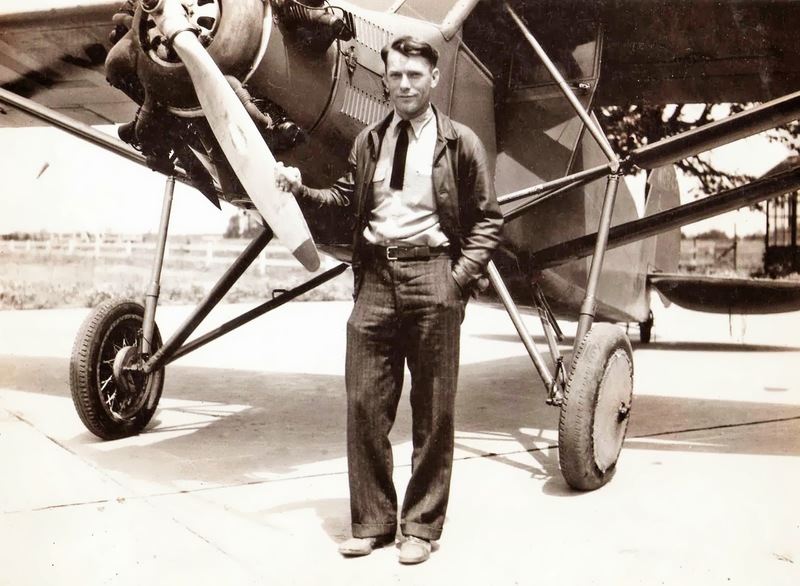 At 5:15 a.m., 17 July 1938, Corrigan and his Robin took off from Floyd Bennett Field and disappeared into a cloudy sky. 28 hours, 13 minutes later, he landed at Baldonnell Aerodrome (now known as Casement Aerodrome), County Dublin, Ireland. He said that he had become disoriented in the clouds, misread his compass and flew East rather than West. He was forever after known as “Wrong Way” Corrigan. Corrigan’s Curtiss Robin was disassembled and returned to the United States aboard ship. The airplane as placed in storage at his home in southern California. In 1988, the airframe and components were transported to Hawthorne Airport (HHR), at Hawthorne, California, where the airplane was reassembled and placed on display. The current status of NX9243 is not known. Original records of NX9243 from the Aeronautics Branch, Department of Commerce, are in the collection of the Smithsonian Institution National Air and Space Museum. Clyde Groce Corrigan¹ was born 22 January 1907 at Galveston, Texas. He was the first of three children of Clyde Sinclair Corrigan, a civil engineer, and Evelyn Groce Nelson Corrigan, a school teacher. Corrigan began flight instruction in 1924, flying a Curtiss “Jenny” at Grand Central Air Terminal in Glendale, California. Lessons were expensive and his training took time. He first soloed 25 March 1926. 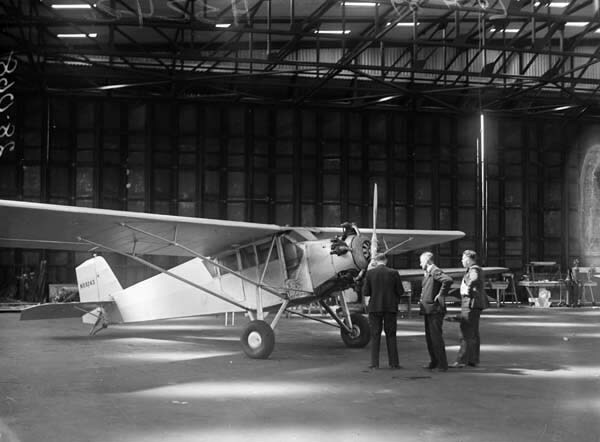 In 1927, Corrigan was employed by B.F. Mahoney Aircraft at San Diego, California. This soon became the Ryan Airlines Company. Corrigan is reported to have worked on the construction of Charles A. Lindbergh’s Spirit of St. Louis. Douglas Corrigan wrote his autobiography, That’s My Story, which was published 1 January 1938 by E.P. 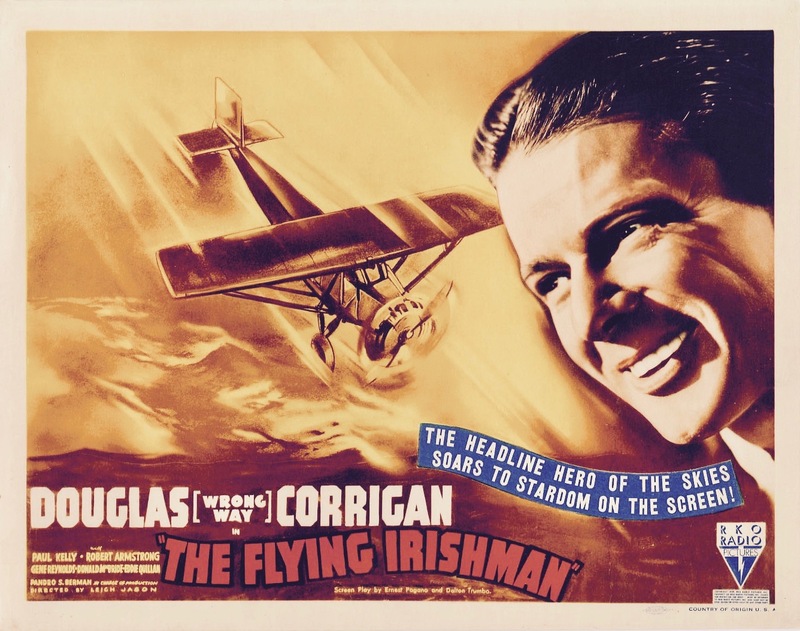 Dutton & Co.
Corrigan starred as himself in the 1939 RKO Radio Pictures movie, “The Flying Irishman,” produced by Pandro S. Berman, directed by Leigh Jason, and written by Ernest Pagano and Dalton Trumbo. The movie was released in the United States on 7 April 1939. On 17 July 1939, Corrigan married Miss Sarah Elizabeth Marvin at San Antonio, Texas. They would have three sons, Douglas, Harry and Roy. During World War II, Corrigan flew as a test pilot for Douglas Aircraft Company and for the U.S. Army Air Corps Ferrying Command. Later, he became an orange grower. He and his wife lived at a home in the orchards near Santa Ana, California. Mrs. Corrigan died in 1966, and their youngest son, Roy William Corrigan, was killed in an airplane crash on Santa Catalina Island, off the coast of southern California, in 1972. Clyde Groce (“Douglas”) Corrigan died at St. Joseph’s Hospital, Orange, California, 9 December 1995. He was 88 years old. He was buried at Fairhaven Memorial Park, Santa Ana, California, alongside his wife and son. ¹ On 12 February 1942, The State of Texas Department of Health, Bureau of Vital Statistics, issued a corrected birth certificate, showing Corrigan’s name as “Douglas Corrigan.” The affidavit was sworn to by W.M. Marvin, father of Corrigan’s wife. (NOTE: The original, hand-written certificate of birth gives his name as “Clyde Groce Corrigan.”) His father’s first (given) name was Clyde, and his mother’s middle name was Groce. Corrigan’s younger brother, born the following year, was Harry Groce Corrigan. It seems unlikely that the officially recorded name was in error, as sworn to by Mr. Marvin. A great accomplishment, and a great example of thumbing your nose at government interference, and he is forever remembered as too dumb to tell East from West? A clever lad! His book was titled, “That’s My Story”…. (and I’m sticking to it.) He got a 14-day license suspension which was over by the time he returned to America (by ship). The second photo appears to be Mr. Corrigan but he is not standing next to his Robin. It is another similar type. Looks to be an early Stinson or Travel Air as the tail is rounded and the cowling is different. You are correct Dan. Thank you. I can just make out part of the registration: “NC84xx.” The airplane is a Stinson Junior SM-2AA.